Paint and Finishing | Team Industries | TEAM Industries Inc. Team's SSPC-QP3 Certified Coating Facility uses the latest technologies for the surface preparation and coating application of pipe spools, vessels, and structural supports. 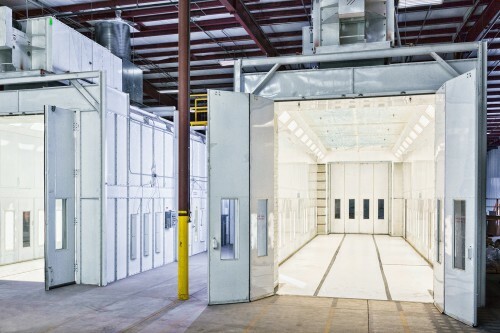 Located at the Kaukauna, Wisconsin, home plant, the coating facility covers 60,000 square feet and houses 2 abrasive blast cleaning booths and 4 coating application booths. The NACE and SSPC certified staff supervise all quality control inspections throughout the coating process to confirm customer specifications and requirements are met. A computer tracking system keeps the material moving through operations for on-time delivery. Team's coating subcontractors are located in close proximity to all facilities. Each is qualified and monitored by Team's certified staff to ensures the highest standards of workmanship. Integration of Team's computer tracking system to subcontractors ensure accountability and accurate, on-time delivery of coated materials to the job site.